This week the men have been busy working on a parapet wall rebuild and lintel replacement project in Oak Park. 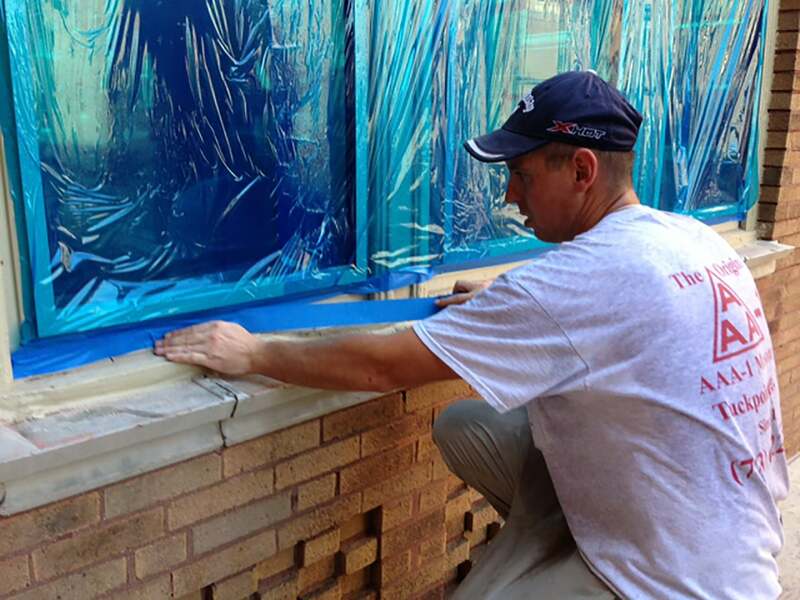 Because the parapet wall and lintels are located upwards of 50 feet above grade in some places, all of the windows within the project area were well-protected with plastic window film and blue tape to avoid the possibility of damage before a single brick was removed. It costs us more in labor and materials to protect the windows this way, but it reduces the likelihood of damage to the original 100-year-old wood and glass. It’s one more way we communicate our commitment to professional site protection and workmanship. This is part two of a two part post. Read the first part here. Back in July, this former dairy looked like the photo at the topon the left. Three months later, I took another photo of the same area (the "after" photo, at the bottomon the right) I tried to get the men to stand about where they were standing in the "before" photo. They did amazing work on this structure. And with the new roof installed you can barely recognize it! The men rebuilt the 16"-thick north elevation wall on the left and the west elevation wall directly across from me in their entirety using reclaimed common bricks salvaged from the adjacent vacant building purchased by the owner expressly for this purpose! The numerous door openings seen in the first photo were removed and converted into window openings. The unattractive in-filled brick arches over the windows were removed and new headers made of re-claimed timbers installed. All of the joist pockets at the very top of the walls were removed and new joist pockets created to accommodate the German-made standing-seam zinc roof ... which we learned comes with a 100-year warranty! Along the southern wall on the right side of the photo, the men dismantled and rebuilt the upper 6 - 8 feet of wall with reclaimed bricks, and per the owner's instructions left the old parging and paint on the wall. Even with today's digital technology, my camera cannot properly capture the amazing quality of the light and the sense of soaring space in this portion of the former dairy. Walking into this space overwhelms the senses with good feeling. With the even lighting, the pleasing hue of the sandblasted brick walls, the rhythmic spacing of the oversized windows and the 25'-high ceilings, the space seems to vibrate at the right aesthetic frequency. Mission accomplished! Here Kamil holds up a sample of the brick used to construct the defective chimney. Look at that unusual undulating shape...the Mae West of bricks! The design of this brick is unusual and clever. Four bricks laid at 90° angles make a nice looking circular chimney shaft. Too bad the brick is so porous and prone to spalling. 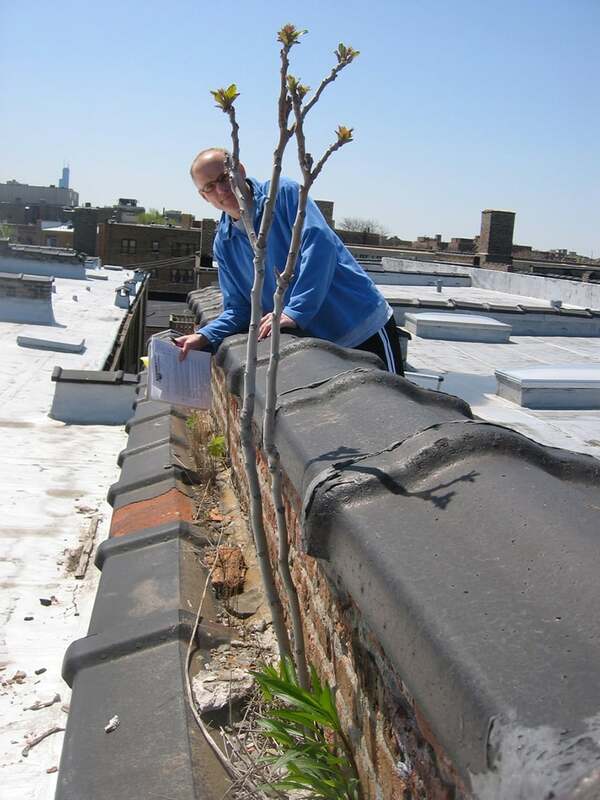 This week one we started up a project in the West Logan Square neighborhood of Chicago. 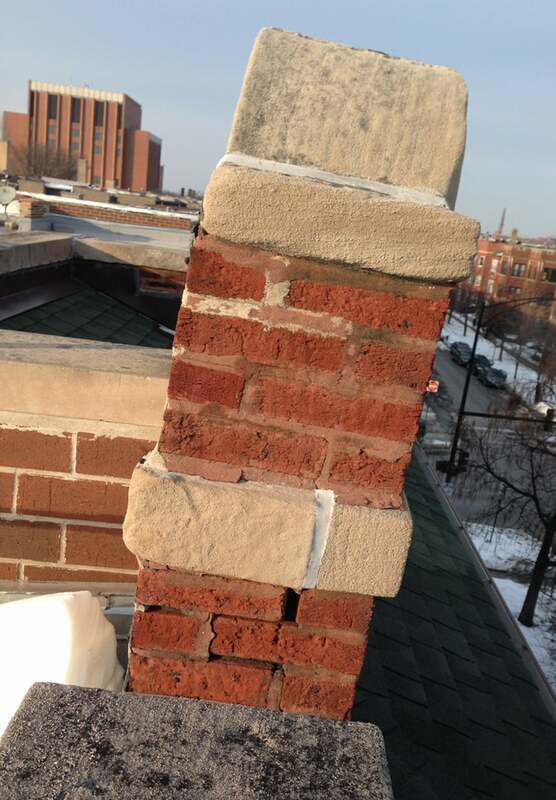 The scope of work entailed dismantling and rebuilding deflected parapet walls and a failing chimney on a lovely 100-year-old two-flat constructed entirely of brick (no concrete blocks to be found in a structure of this vintage). 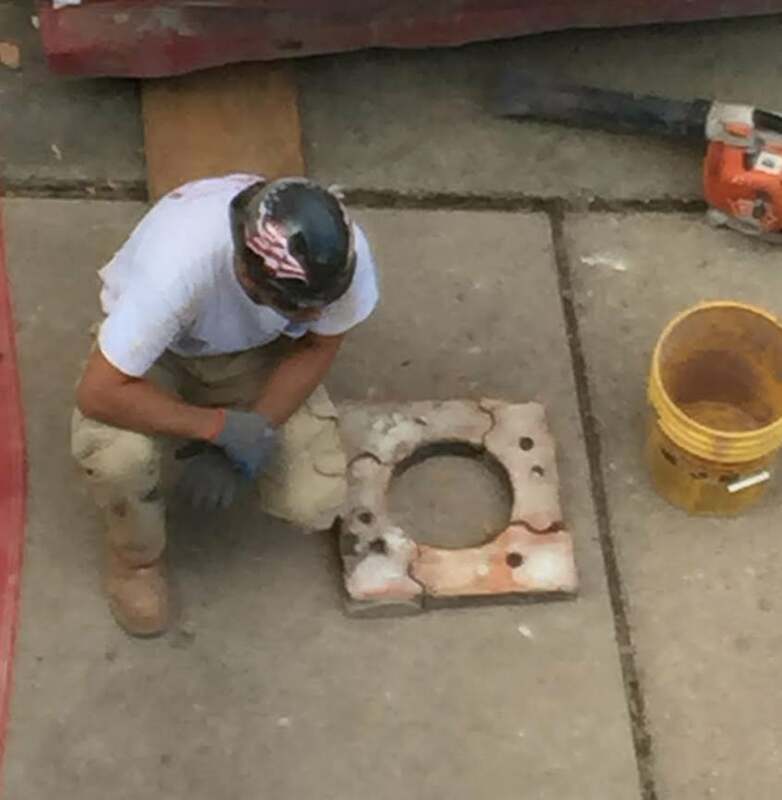 I had been called out to inspect this structure immediately following its purchase by the new owner. Usually a prospective buyer calls in AAA-1 Masonry & Tuckpointing before a deal closes in order to identify costly issues which may influence the final purchase price. In this case, however, the building had been sold slightly below market value by a friend of the prospective buyer in an "as is" condition. Very little maintenance had been performed on this building over the decades, so the opportunity to perform less costly maintenance repairs was no longer available, and the new owner now had to dismantle and rebuild parapet walls and chimneys in their entirety. We knew there was something unusual about the west elevation chimney because it was sitting on its own concrete pad (odd for this era of construction; the entire two-story building was sitting on a brick foundation). We also noticed that the entire chimney shaft from top to bottom was heavily parged, indicating significant issues with the integrity of the chimney shaft. Sure enough when we took down the chimney we found that it had been constructed with a newer as-yet unidentified brick (see photos aboveat right). Neither I nor any of the masons had ever seen this type of brick before. And although it was cleverly designed (refer to second photo), the brick was not well constructed and appears to have failed long before any other area of the original building. This particular chimney was used to vent two older furnaces responsible for heating the apartments. The new owner elected to replace the furnaces with two super-high efficiency units which allowed him to exhaust the furnace gases directly through the basement wall with PVC tubing, so the defective chimney did not need to be rebuilt (which saved the new owner many thousands of dollars and allowed him to afford additional repairs needed elsewhere). 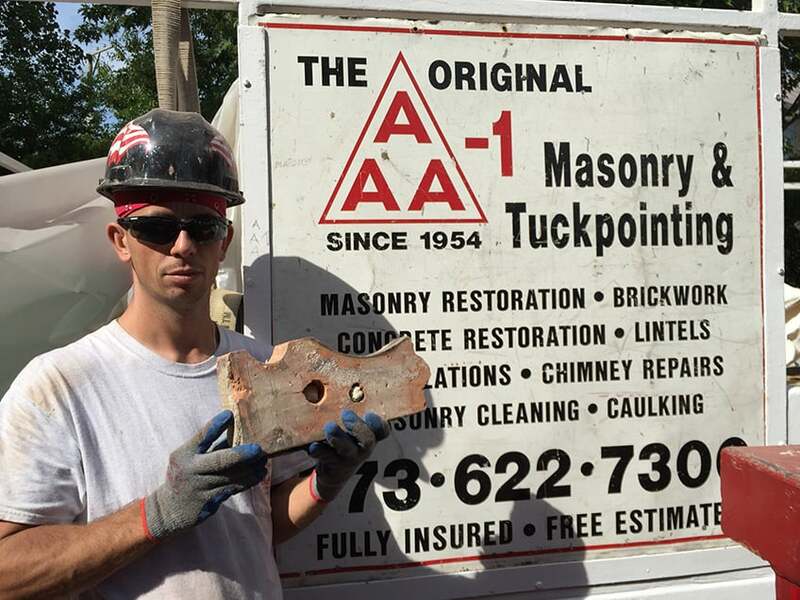 Even for a masonry restoration company in continuous operation for more than 60 years, there is still more to discover, as evidenced here. Should you have a crumbling parapet wall or a failing chimney, call us for an honest assessment and a free quote. Who knows what we will discover together!